According to Federal law, individuals must stay at least 500 yards away from the whales. It doesn’t matter if you are in a boat, on a paddle-board, or even in a plane, the gap must be 500 yards. A violation of this federal law could cost you up to $500,000 and a year in jail. The Florida Fish and Wildlife commission has stated they would prefer to educate people instead of imposing citations, but will bring criminal charges if needed. 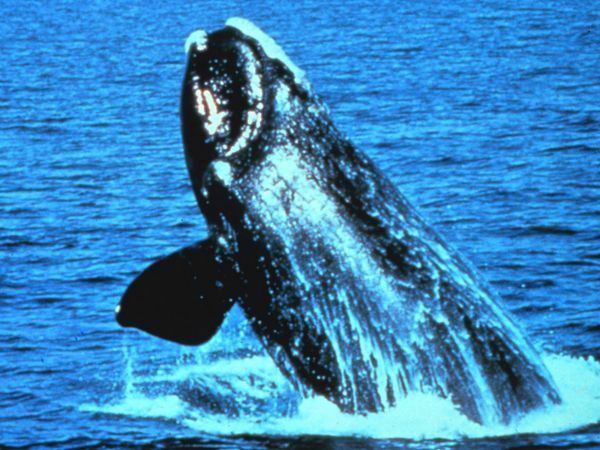 The right whale population is only thought to number about 500 individuals. They are currently a protected, endangered species. Although they have historically lived to an average of 60 years, their lifespan has been drastically shortened due to being struck by boats, getting caught in fishing nets, and being targeted by hunters for their blubber. In the winter, pregnant right whales swim from as far away as Canada to get to the warmer coastal waters off the Georgia and Florida coast. Here they give birth and nurse their young. In the early spring, they head back to their feeding areas which start in Maine and move northwards into Nova Scotia and Newfoundland. As they migrate back north, they may be seen in one location for a few days because they are very slow swimmers.